Library image #2280: A november black spruce forest. The United States Congress designated the Mackinac Wilderness (map) in 1987 and it now has a total of 11,363 acres. All of this wilderness is located in Michigan and is managed by the Forest Service. Near the end of the 1910s, Mackinac Wilderness Area had been severely logged. But nature's regeneration has allowed second-growth forest to reclaim the land, and some trees have been standing for 60 to 80 years. In the northeastern section you'll find a dense forest of northern hardwoods with stands of birch and aspen growing on low ridges. 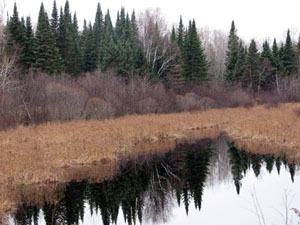 The rest of the Wilderness consists of large wetlands set between sand ridges, shallow bogs, and marshes with small clumps of trees. Ever-ambitious beavers continually dam drainages, creating seven major ponds. In the northeast, at the edge of the wetlands, seven-acre Spring Lake forms the headwaters of Spring Lake Creek. Wildlife native to the area include the bald eagle, osprey, sandhill crane, great blue heron, pileated woodpecker, ruffed grouse, black bear, raccoon, pine marten, mink, muskrat, red squirrel, and snowshoe hare. White-tailed deer winter here in thick stands of trees. Most visitors come for Mackinac's most notable feature, the Carp River. Flowing through the heart of the Wilderness, the sandy-bottomed Carp features water-carved riverbanks and numerous oxbows. Brook, rainbow, and brown trout spawn in the Carp and its tributaries, luring anglers. Planning to Visit the Mackinac Wilderness? How to follow the seven standard Leave No Trace principles differs in different parts of the country (desert vs. Rocky Mountains). Click on any of the principles listed below to learn more about how they apply in the Mackinac Wilderness.